This book comes with all the plastic pieces, paper parts, and special pages you need to experience 25 impossible things. These objects work like magic, but there are no tricks. All this weirdness has a solid scientific basis and we tell you why — from the mathematically amazing Möbius strip (a band of paper with only one side), to cardstock acrobats with amazing balance, to a color-changing spinning top. Use the 4 inkpads, marker, and dual-tipped colored pencil to make thumbprint versions of your favorite Star Wars characters. 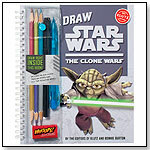 Simple step-by-steps include — Clones and Battle Droids, Ewoks and Wookies, Jedi and Jabba the Hutt. Star Wars fans will love re-creating key moments from the movies and creating scenes of their own. 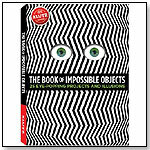 This book comes with all the plastic pieces, paper parts, and special pages you need to experience 25 impossible things. These objects work like magic, but there are no tricks. All this weirdness has a solid scientific basis and we tell you why — from the mathematically amazing Möbius strip (a band of paper with only one side), to cardstock acrobats with amazing balance, to a color changing spinning top. Make Clay Charms features simple step-by-steps for more than 30 different designs — cute fruit, adorable animals, sweet treats, and tons more. Make your charms with the nine bright colors of clay, bake them, add shine (with our specially formulated glaze), and then attach your creations to the included bracelet. — Dean Smith, owner of JaZams in Princeton, N.J., told TDmonthly in a May 2014 survey that Make Clay Charms from Klutz is the store's best-selling activity kit. This is a journal of super-nosy surveys to fill out. Subjects range from food to fashion to friendship. Over 300 different questions reveal everything you never thought to ask yourself, let alone anyone else. Each survey is repeated three times, in three different colorways to make it easy to share and compare with friends. Super-clear directions walk kids through seven unique bracelet designs, all based on a simple weaving technique. Use our custom loom and included beads, cord, needle, and thread to create a wardrobe of beautifully beaded bands that can be worn wrapped, stacked, or stylishly solo. 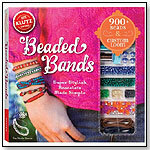 Comes with: custom loom, over 900 glass and specialty beads, closure beads, cord, beading thread and 3 needles. 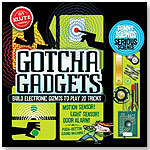 This set of customizable gizmos includes a book of games, pranks, and jokes that make the most of them. The 16 different sound-and-gizmo combinations offer limitless opportunities for immature humor. Follow simple instructions to wire a door alarm, motion sensor, light sensor, or push-button device; then program it with one of four funny sounds. Comes With: circuit board, speaker, LED, battery clip, photoresistor, switches, project wires, alligator clip, gadget dock, gadget case, 4 gadget covers, 2 doorbell hangers and 2 door alarm hangers. Launch date: September 1, 2012. Few things are as satisfying as the THONK! of hitting a target. 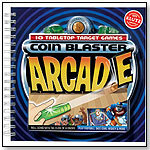 With Coin Blaster Arcade, even novice sharpshooters can flick coins with surprising speed and accuracy using the included “coin blasters” — the world’s first coin-operated, finger-powered mini-cannons, only from Klutz. The book is full of awesome tabletop target games including Hot Shot Hoops, Break the Bank, Skee Coin, and Penny Putt Golf. Ten different games test your coin blasting mastery and let you dominate the kitchen table. Create fully formed outfits that are amazing from any angle. 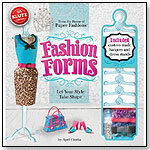 Use mix & match patterns to trace and cut shapes that are easily folded, wrapped, and rolled into tops, skirts, coats, and more. Photos, illustrations, and step-by-step instructions make assembly simple. Embellish your fashions, accessorize, and display on the custom hangers and dress stands. Comes With: 3 dress stands, 5 hangers, 20 sheets of double-sided patterned paper, 6 sheets of tissue paper, 18 pattern pieces, 1 sheet of stencils, ribbon, clear cording, sequins, glue. Launch date: July 6, 2012. Everything kids need to fly like a pro, indoors or out. 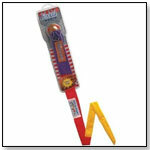 Our three only-from-Klutz, rubber band powered airplanes have been carefully engineered for coolness, from the extra-large Firebird (an impressive 19-inch wingspan), to the acrobatic Lightning Looper (it really loops), to the Shooting Star (which makes such tight turns kids can fly it in the living room). Simple directions explain how to assemble the planes from the included parts and, just as importantly, how to fly them for maximum performance. And by experimenting with the variations in the book, junior aviators will learn basic principles of aerodynamics and physics. 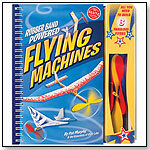 — Mary Porter Green, owner of The Curiosity Zone in Ashburn, Va., told TDmonthly in a November 2011 survey that Klutz flying books are her best selling flying toy. — In a November 2013 survey, Mary Porter Green, owner of Curiosity Zone in Ashburn, Va., told TDmonthly that they sell several of these books each month. — In a December 2013 survey three out of 10 retailers said that Klutz made their best-selling books. 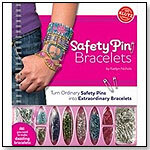 Clear directions for ten different kinds of bracelets, with all the colorful floss and beads needed to make them. A built-in clipboard provides the ideal work surface for this craft. — Mike DiAndrea, manager of Hardware Toys in Paoli, Pa., told TDmonthly in October 2011 that they sell about 8 of these kits each month, making them a best seller in the jewelry and accessories category. 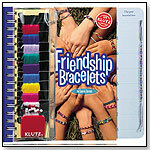 — In a January 2012 survey about arts and crafts toys, two out of 13 retailers said that Klutz's Friendship Bracelets book was a best selling toy. — Want this? As of 05/11/2011 this product was available at The Curiosity Zone. 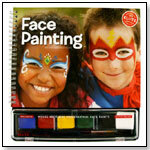 This new edition of Face Painting was completely refreshed, revised, and revitalized for a new generation. Klutz added more detailed directions for simple sponge and brush techniques and created tear-out cheat sheets to make painting birthday parties easier than ever. But the biggest change is the Wolfe Brothers face paints. They go on smoothly, dry quickly, last longer, and wash off easily, with bold, bright colors. 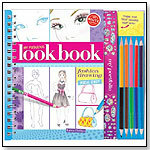 The book comes with a six-color palette of face paints, a brush, a sponge, and 12 tear-out take-along design cards. — Her Halloween 2010 crowd liked the Klutz face painting book, reported Gwen Bowden, manager of Doodlehopper for Kids in Springfield, Va.
— In a December 2011 survey about best selling Halloween products, 3 retailers said face painting kits were among their best sellers. — Syd Clarke, owner of Ali-Cat in Carrboro, N.C., told TDmonthly in a December 2014 interview that Face Paint from Klutz is one of their best-selling Halloween toys. 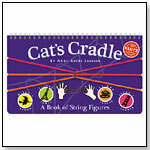 Written by Anne Akers Johnson, this illustrated book provides painstakingly clear instructions for five different string figures. Attached to the book is a tie-dyed string loop – all you need to bring is ten fingers. The four-millionth copy will sell any day now and, to prepare for that happy occasion, Klutz has given the book a brand-new cover. This Foxtail breaks the sound barrier every time you throw it. Whistles lodged in the leather-covered soft sponge ball shriek as it whizzes through the air. 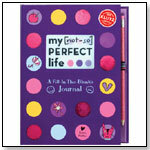 Written by Karen Phillips as a fun, inspiring journal to celebrate the lives of tween-aged girls, My [Not So] Perfect Life invites a young lady to overcome the blank page. 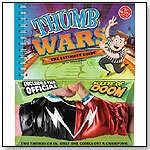 It is filled with fun, often humorous writing prompts in a 'fill in the blank' style. The journal contains prompts about parents, friends, school, love, destiny, and many other subjects, and is written in a smart, funny voice sure to make any girl feel great about herself. The book comes with a sparkly pencil that fits in the elastic holster right beside the pages to keep it always handy. 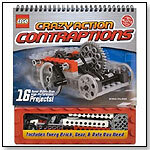 — “A lot of Klutz sells really well for the with the tweens,” said Kristie Lash, manager of Leapin' Lizards Toy Company in Bend, Ore., in September 2010. — “Anything in the Klutz line … is a good standard seller,” said Terri Soelter, owner of Teri's Toy Box in Edmonds, Wash., of her best sellers for tweens during a September 2010 survey of 44 retailers. — “I find them a boost for self image and promote them that way,” remarked Joe Berardoni, owner of Pun's Toy Shop in Bryn Mawr, Pa., of what makes Klutz books a best seller for tweens in his store.